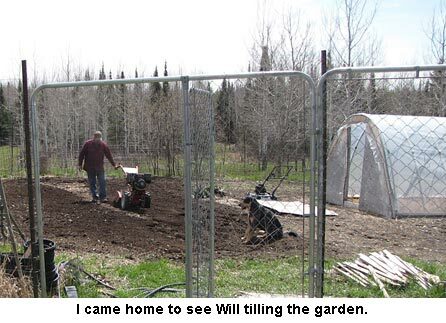 Because we currently have three tractors torn apart, waiting for cash to buy parts, we haven’t been able to get started tilling the gardens as early as we’d like. So when I got home from mailing a batch of seeds this morning, I found Will hard at work tilling our main garden the “old” way; using our two decades-old Troy-Bilt Horse tiller. I was really impressed to see how nice our garden soil is looking. After all, I remember well having to haul trailer loads of big rocks off it every spring and the soil being sand and gravel. Now there are only a few small rocks and the soil is nice and black. Wow, that’s wonderful. Now we have another garden to make that nice. 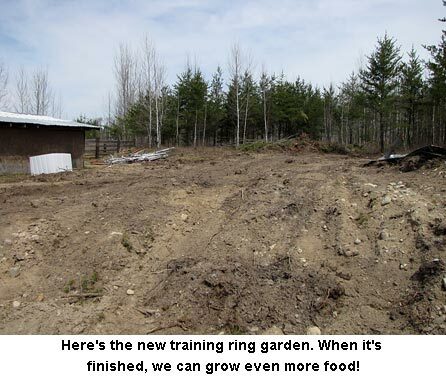 Will was hard at work next to the training ring barn, dozing the new garden area clear of trees and then leveling. He was just getting ready to shove the “hill” on the far end down by the barn into a big pile (to use on the driveway) when the dozer went… the track won’t stay tight. The seal’s not expensive, but it’ll have to wait — just like the tractors. David and Ashley’s ducklings are nearly “real” ducks now and are still living in the big plastic tote in the bedroom. 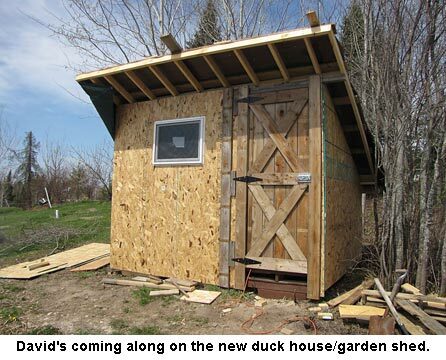 So David is VERY motivated to get the duck house/garden shed finished. Yesterday, he worked from early morning to after dark on it. Now it’s all closed in with a big window to the east and a duck door to the west and a people door next to the window. He also put one coat of stain on the floor and will do another coat tonight after work. As ducks are very wet critters, he wants to give that floor four coats. Just because. Our rhubarb and asparagus are coming up nicely. 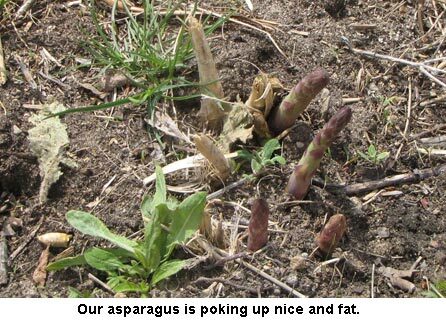 We should be eating asparagus by mid week. Yum. I could eat it three meals a day! The berry patch is fantastic. Our Mac Black black raspberries have all not only survived the winter but look great. And the blackberries we’ve struggled so hard to have survive are also wonderful this spring and very lusty. Finally, this year, I’m getting the grapes up on an arbor! This afternoon I’m going to prune them severely (the vines are running twenty feet along the ground!) and we’re going to train them up on a stock panel arbor so they can be maintained better. I can’t wait! Ok so right now I will have about 4-6 Fall Gold raspberry plant…I will trade you for some of the black raspberry plants. I have tried unsuccessfully to start them from seed, but no plants! :-( Glad you are on the ‘mend’ from you cold. I think I made a critical error today. We had only 2 good sized asparagus up, so my 6 year old and I picked them. I had her taste one raw and she loved it. I may be in as much trouble as the year we had free range ducks…they gobbled up the shoots as soon as they were visible, and we had none to eat that year, lol!